Shows » Black-capped Chickadee - Birdbrain? What's going on in those tiny little brains? A lot! In spring, the Black-capped Chickadee adds a new vocalization to its repertoire. 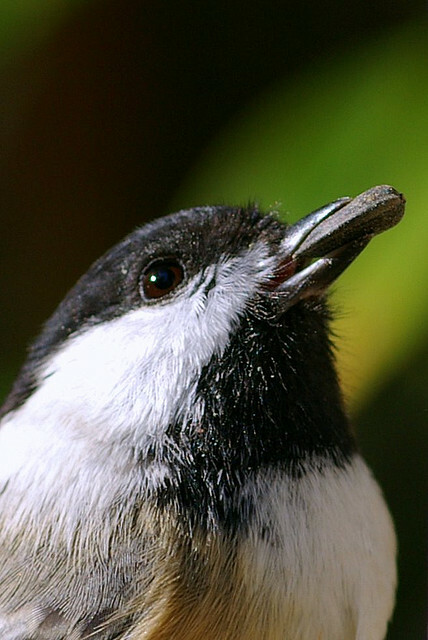 When breeding season begins, the tiny brains of Black-capped Chickadees and other songbirds enlarge to enable the birds to create more sounds. After the breeding season is over and the birds no longer need that singing function, the part of the birds' brains that controls vocalizations decreases in size. Read this fascinating article about the research of Fernando Nottebohm on the brain behind bird song. 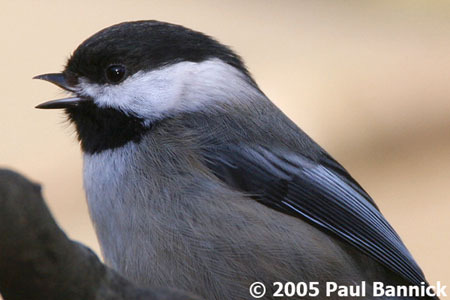 We’re hearing the year-round sound of the Black-capped Chickadee. When breeding season begins, the tiny brains of chickadees and other songbirds enlarge to enable the birds to create more sounds. After the breeding season is over and the birds no longer need that singing function, the part of the birds’ brains that controls vocalizations decreases in size. Studying the ability of a bird’s brain to generate new neurons in order to sing in the spring [Fee bee bee] fundamentally altered how scientists think about the human brain—and opened the door for new research on understanding degenerative brain conditions, including Parkinson’s and Alzheimer’s diseases. One of the scientists studying neuron replacement in birds’ brains is Fernando Nottebohm of Rockefeller University in New York. After first studying the brains of canaries and finches, he focused on the remarkable ability of Black-capped Chickadees to store hundreds of seeds and recall their locations when needed. You can learn a lot more about Nottebohm’s research, when you come to our website, birdnote.org. I’m Frank Corrado. Call and song of the Black-capped Chickadee provided by The Macaulay Library of Natural Sounds at the Cornell Lab of Ornithology, Ithaca, New York. Call recorded by R.S. Little. Song recorded by G.A.Keller. Fernando Nottebohm research: Stem cell therapy - a bird-brain idea?